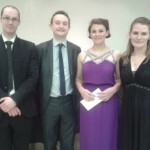 The occasion was the Festival’s Mini-Showcase at Taggs Yard, the home of Judith Hildesley, on the 18th of May for the major award winners of the Richmond Festival. Ben is 13 years of age and he performed his winning programme entitled Landscapes of the Soul, which included Linden Lea by Ralph Vaughan Williams, Daffodils by William Wordsworth and Sweet Chance by Michael Head. 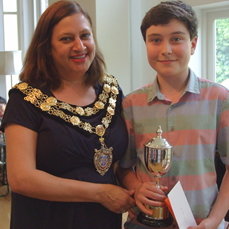 Ben Gibson receiving his AESS Prize cheque from the Mayor of Richmond, Councillor Meena Bond. This entry was posted in Past Events on May 18, 2014 by AESS. 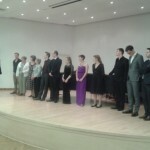 The final took place in the recital hall of the Royal College of Music on Wednesday May 7th at 6.00pm. 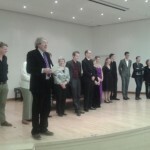 Five finalists performed their themed programmes of twenty minutes to an enthusiastic audience of members, friends and the general public. 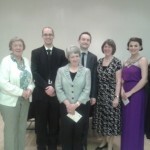 The judges were Judith Hildesley, Jean Hornbuckle, John Lofthouse (a previous winner of the competition) and Jane Roberson. 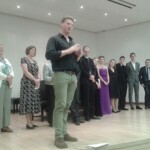 We are grateful to them, and the staff and stewards of the RCM for their hospitality. 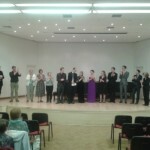 Congratulations to them and thanks to everyone who took part in the competition. We are extremely grateful to Patricia Routledge for her continued and generous sponsorship of the Senior Prize. This entry was posted in Past Events on May 7, 2014 by AESS.